Right now, three hurricanes are spinning in the Atlantic Ocean, an unusual event that hasn't happened since 2010. Even stranger, each of them is expected to hit land on the same day: Saturday. First, there's record-shattering Hurricane Irma, of course, which devastated parts of the northern Leeward Islands, as well as the Caribbean, and poses a dire threat to the Southeast. It is forecast to pass over or very close to South Florida on Saturday night into Sunday as a Category 4 or 5 storm. As it does so, it will be a life-threatening storm with potentially devastating winds and deadly storm surge flooding along the coat. Lurking behind Irma is Hurricane Jose, which is gathering strength and threatens some of the same areas left devastated by Irma. On its current forecast path, Jose is expected to pass near or on top of the northern Leeward Islands, including Barbuda and Antigua, on Saturday. It's possible the storm will miss these islands and others, but hurricane watches have been issued in case they come close enough to bring hurricane conditions. A direct hit by Hurricane Jose would severely hamper relief efforts in these locations at a time when humanitarian needs are highest, after many homes and businesses were destroyed by Hurricane Irma, which was the most intense storm ever to make landfall in the northern Leewards. After passing the Leewards, Hurricane Jose is forecast to eventually move further north, away from the U.S., though some computer models project a meandering path that bears close watching next week. Lastly, there's Hurricane Katia, which formed on Wednesday in the southwestern Gulf of Mexico. Hurricane Katia is moving southwest while intensifying, and is projected to make landfall on Friday night into Saturday in the state of Veracruz as a Category 2 or 3 storm. 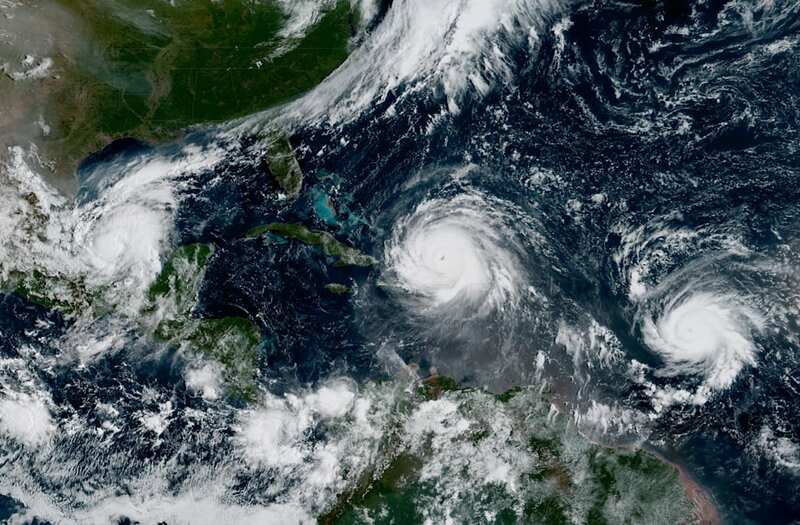 The National Oceanic and Atmospheric Administration (NOAA), which is responsible for monitoring and forecasting hurricanes, had predicted an above average Atlantic hurricane season. Hurricanes Katia (L), Irma (Center), and Jose (right), seen by satellite on Sept. 6, 2017. This forecast was based in part on the absence of an El Niño event in the tropical Pacific Ocean, as there was last year. Such events tend to make the environment more hostile for Atlantic tropical storms and hurricanes by increasing upper level winds, which can tear nascent storms apart. Instead, the North Atlantic basin features more ideal conditions for these massive storms this year, with relatively low wind shear, above average ocean temperatures, and a relative paucity of dry air masses that can also inhibit hurricane development.